Just thinking about bedbugs can make your skin feel crawly and itchy. That old childhood rhyme, "Sleep tight and don't let the bedbugs bite," doesn't seem cute anymore. Bedbugs got their name because that's where they're usually found. During the night, these bloodsuckers prey on sleeping humans. They don't spread disease but can leave itchy bites marks on their victims, similar to mosquitoes. Rarely, a person suffers an allergic reaction to a bedbug bite. Cimex lectularius, the common bedbug, feeds on human blood. It might also sample the blood of your pets. The pesticide DDT widely eradicated this pest, but the environmental side-effects led to the chemical's ban in much of the world. No longer just an issue in the developing world, bedbugs are now an equal-opportunity infestation, found in rich and poor areas alike. 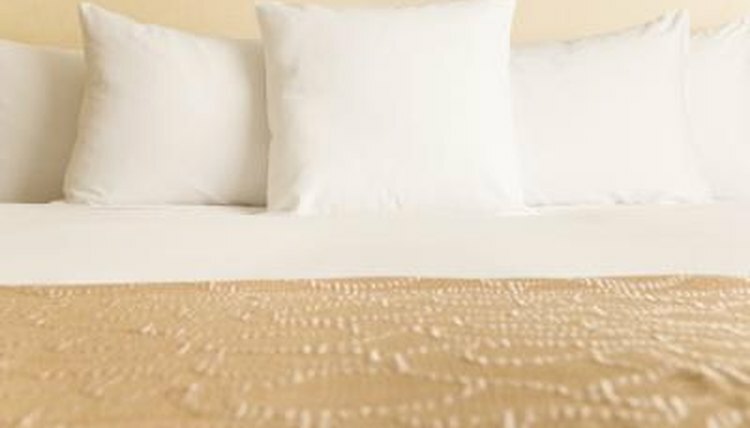 Those staying at hotels are at particular risk of inadvertently bringing bedbugs home in their luggage or clothing. The adult bedbug is approximately 3/16 of an inch long, the size of an apple seed, according to the Mayo Clinic. They have an oval, rusty brown, flat body. Bedbugs are wingless, with prominent antennae. If you put one under a microscope, you'd see an insect with small compound eyes. The prothorax, the area behind their head, protrudes forward on each side. Once the bedbug feeds, its body swells up and becomes more red in color. Bedbug eggs, hard to see with the naked eye, are the size of dust specks. Females tend to lay hundreds of eggs in small batches, generally on paper or wood. Eggs hatch about 10 days after laying. Nymphs, or immature bedbugs, shed their skins five time before maturity. Before each of these molts, the nymph requires a blood meal. Think about that when you're scratching a bite on your leg. Depending on blood availability -- that could be you -- the nymph matures into an adult within five weeks to four months, according to the University of Calfornia-Davis. Adults can live nearly a year, producing three or four new generations of bloodsucking offspring in that time. Even if you don't see any bedbugs, they leave physical evidence behind. According to the University of Kentucky Cooperative Extension Service, bedbugs don't nest, but tend to congregate in the same hiding places. They eliminate in these areas, so you might find dark stains in certain spots -- this is dried bedbug poop. You might also discover leftover nymph molts. If you find rust-colored stains on your sheets or mattresses, this could result from crushed engorged bedbugs. At that point, it's a good bet you'll immediately put in a call to the exterminator. Are Chiggers in Every State? What Is a Carpet Beetle & What Do They Look Like?